Sixth grade All-Conference Award Winners: Ben Dreyer, Tee Skipper, Carson Arnold. All-Conference Award Winners: 6th grade girls - Kylee Kellermann; 7th grade boys - Eddie Marinaro; 8th grade girls - Ashlen Richardson; 8th grade boys - Sam Crowley. Sixth grade basketball playoff runner ups: Front Row (l-r): William Hyatt, Ben Dreyer, John Brookes, Wilson Brookes, Jaque Greene. Back row: Carson Arnold, Stephen Ethridge, Nicholas Roper, Brady Comer, Tee Skipper, Matthew Lemmon, Assistant coach Virgil Greene. Not pictured: Head coach Rob Hamblin, assistant coach Kevin Brookes. 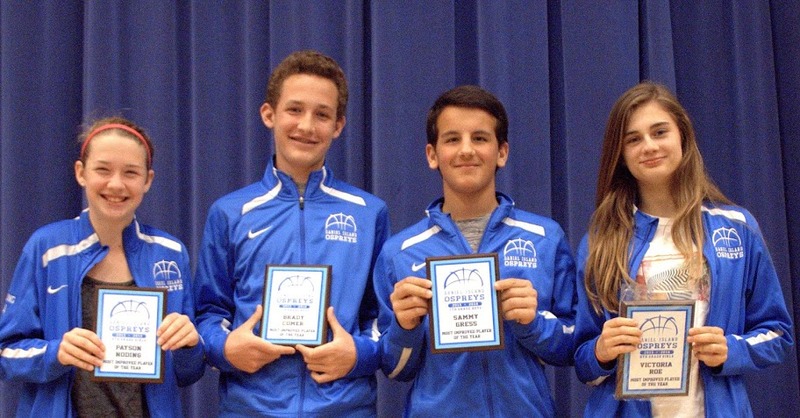 Defensive Players of the Year: 6th grade girls – Sydney Barton; 6th grade boys – Carson Arnold; 8th grade boys – Griffin Williams; 7th grade boys – Chase Loggins; 8th grade girls – Coco Pampu. Scholar-Athlete Award: 6th grade girls - Kylee Kellermann; 6th grade boys – John Brookes; 8th grade boys – Jason Albach; 7th grade boys – Will Culler; 8th grade girls – Coco Pampu. Team MVPs: 6th grade girls - Kylee Kellermann; 6th grade boys – Jaque Greene; 8th grade boys – Sam Crowley; 7th grade boys – Daniel Brookes; 8th grade girls – Ashlen Richardson. Offensive Players of the Year: 6th grade girls - Kylee Kellermann; 6th grade boys – Tee Skipper; 7th grade boys – Daniel Brookes; 8th grade girls – Jaiha Williams; 8th grade boys team – Sam Crowley. Most Improved Player of the Year: 6th grade girls team – Payson Noding; 6th grade boys team – Brady Comer; 7th grade boys team – Sammy Gress; 8th grade girls team – Victoria Roe; 8th grade boys team – Jamal Wiliams (not pictured).